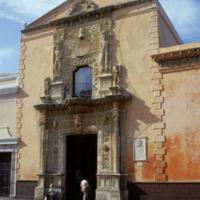 The central portal of this building represents one of the earliest, domestic structures from New Spain that still stands. It is known as Casa de Montejo, for its first patron, Francisco de Montejo II. The carving framing this doorway combines columns, floral elements and human figures. In in the pediment at the top of the building façade, two heraldic lions perch. Between them is a shield with an inscription dated 1549 that names the house’s first patron and resident, Adelanto don Francisco de Montejo. The two soldiers stand upon grotesque heads, with open mouths. Such heads were a well-known part of Spanish architectural vocabulary in the 16th century, although in this context they may have been interpreted as representing the conquered Maya of the region. At the center of the portal, a bearded figure is dressed in sheepskin hunches over as if bearing the weight of the sculptural elements above him. The design work of much of the portal resembles that of silversmiths working in Spain in the 15th century and favored by Queen Isabella. It is thus known as Plateresque (after the smithing) or Isabelline (after the queen). The thin, fluted columns on either side of the entry owe more to newer, 16th-century tastes in architectural décor than the elaborate Plateresque carving above, on the second floor of the house. To the right of the doorway, the large rectangular plaque is an addition to the original structure. Its text explains the historical significance of the structure for visitors. 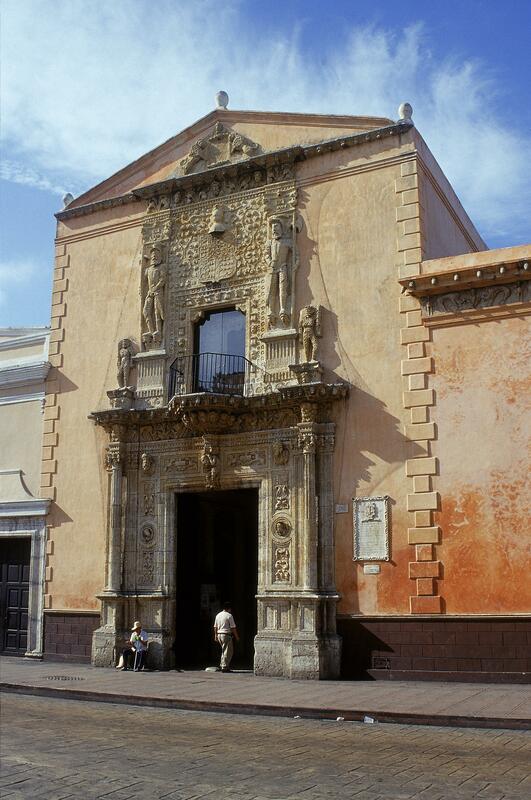 The original patron of this house was Francisco de Montejo II, the son of a conquistador. The architect was of European descent, as well. But much of the labor required to build the house would have been provided by Maya people. The iconography of the central doorway includes numerous references to the patron and first resident of the house—as was common in Spain at the time and would later become standard throughout Spanish America among the wealthy. While some imagery may reference the local region and its Maya inhabitants, the elaborate carving is tied far more closely to European models of expressing status, suggesting this was the visual language conquistadors preferred as they established themselves in New Spain. Dana Leibsohn and Barbara E. Mundy. Vistas: Visual Culture in Spanish America, 1520-1820. http://www.fordham.edu/vistas, 2015. Barteet, Cody. 2010. "The Rhetoric of Authority in New Spain: The Casa Montejo in Mérida, Yucatán." RACAR: revue d'art canadienne 35 (2): 5-20. Heilskov Rasmussen, Christian and Luis Millet Cámara. 1994. Mérida en la época colonial y del oro verde. Mérida: Ediciones de la Universidad Autónoma de Yucatán. Rubio Mañe, J. Ignacio. 1941. La casa de los Montejo en Yucatán—con un estudio de Manuel Toussaint. Mexico: UNAM. Siller, Juan Antonio and Jaime Abundis Canales, 1985. “La casa del Adelantado Francisco Montejo en Mérida.” Cuadernos de arquitectura virreinal 1: 24-47. Talavera, S. Leticia and P. Maritano Monterrosa. “Merida,” The Grove Dictionary of Art Online (Oxford University Press).